Here is the list of some of the best holiday packages hand picked from www.aaochale.com. These holiday packages are unique in itself, do read the details by clicking the link and send enquiry to get the best deals. If you are planning for your honeymoon at a perfect destination at hill stations then this package is for you. Start your married life with the very first moments among the majestic snow clad himalyan peaks of beautiful manali. Kerala the gods own country boast unique experience for honeymooners as well as famelies. Called the venice of east kerala offers you house boat ride in the backwaters. spending a night in the cozy houseboat is a different experience. 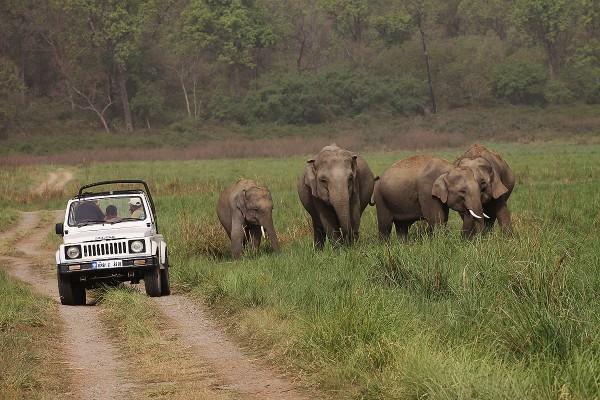 Roam among the tigers at corbett national park. one of the most sought after weekend destination for the people living in NCR region. With the presence of affordable to stylish resorts around you can be sure that your weekend will be well spent among the beauty of the nature around. Do you love and fascinated by the monuments and heritage sites , then this golden triangle holiday package is perfect for you as it covers Delhi , Agra and Jaipur all in one and these are the places to see the rich heritage and lagecy of India. The beautifull hill station of khandala on the western ghat is very well connected with Mumbai and Pune and is the best option for people who want ot spend a quite weekend away from the crowd and noise of the metros. For complete list of other holiday packages do visit our website by clicking on this link. Why Uttarakhand should be your choice for holiday destinations. Uttarakhand is a state located in the northern part of India bordering the state of Himachal Pradesh in the west, Uttar Pradesh in south with Nepal in East and Tibet in North. 86% of Uttarakhand is mountainous and most of the northern part is covered with high Himalayan Peaks and Glaciers from where many rivers originate. 65% of the state is covered with forest which is home to thousands of varieties of Flora and Fauna. 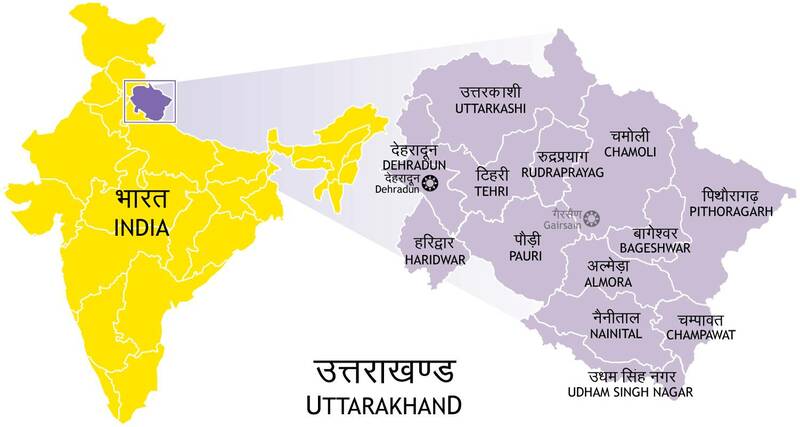 Uttarakhand is divided into two divisions namely Garhwal and Kumaon with capital at Dehradun. Some of the major towns of Uttarakhand are Dehradun , Haridwar ,Pauri , Pithoragarh , Almora , Nainital , Ranikhet. Agriculture and tourism are the main sectors of economy in uttarakhand with now hydropower plants , Food processing , IT and manufacturing sector setting up base in uttarakhand. Uttarakhand also called ‘Dev Bhoomi’ the land of Gods is divinely blissful, beautiful and majestic gem among the best of Mother Nature’s treasure on this earth. The variety of experiences that a traveler can get in uttarakhand is far far more than any other location. The credit of the beauty and diversity of uttarakhand goes to the majestic Himalayan ranges of this region which gives rise to the most sacred rivers of India which is Ganga and Yamuna apart from many others. The mention of Himalayas can be found in world’s most ancient, sacred and mythological literature and cultures of Hindus. Himalaya has always been a sacred and spiritual destination from ancient times of Hindu scholars and sages with numerous holy destinations like Haridwar, Kedarnath , Badrinath , Gangotri , Yamunotri and many more. 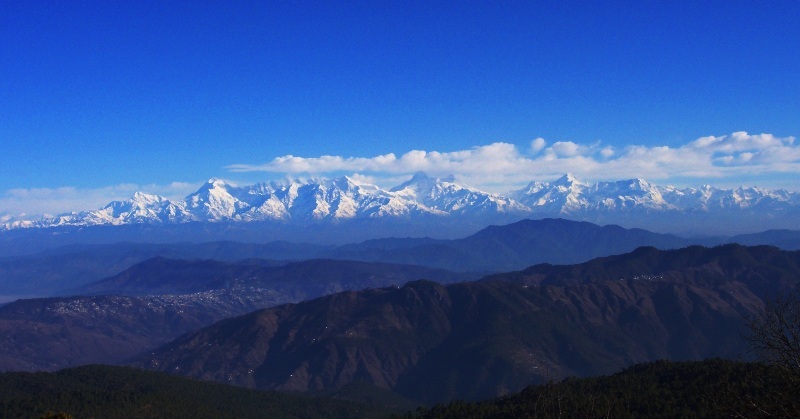 Since history uttarakhand had mostly been a pilgrimage destination because of the holy places and associated mythology but now uttarakhand proudly boasts its beautiful hill stations and honeymoon destinations like Nainital , Mussoorie , Ranikhet , Lansdowne , Pauri , Kausani and many more. The ever-flowing rivers, the landscape and the lush green forest spread across uttarakhand where wildlife bursts with hundreds and thousands of species welcome tourists for adventure activities like river rafting, trekking, camping, jungle safaris, photography and much more. The winter season in uttarakhand transform some of the places in heaven for tourist if you want to experience snowfall or want to try skiing than visit to uttarakhand is what you should be thinking during winters. Words can never be enough to perfectly describe the beauty and spirituality of uttarakhand, whatever is your taste, choice and purpose of visit there will be enough of places to choose from to quench your desire in Uttarakhand. Uttarakhand is very well connected through roads to rest of the country and is just 4 to 5 hours road distance from Delhi , Gurgaon , Noida , Faridabad , Ghaziabad, Chandigarh and other cities of North India making it the best place for finding best holiday packages and a quick weekend destinations. 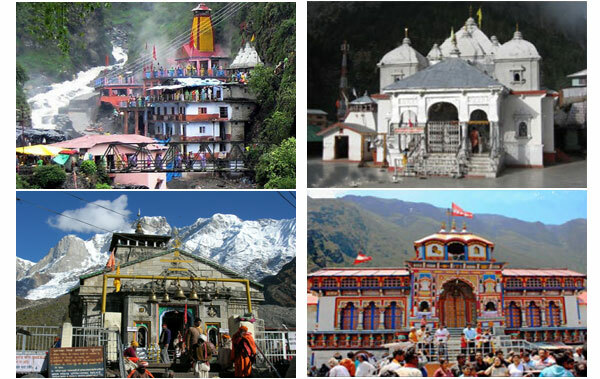 Uttarakhand is home to the holiest of shrines, places and temples of India. Lakhs and lakhs of devoted Hindus take pilgrimage to Badrinath , Kedarnath , Gangotri , Yamunotri every year even after facing acute weather and hilly terrain drawing strength from the spirituality they receive on reaching these shrines in high altitudes of Himalayan snow clad mountains. Apart from these Haridwar, Rishikesh, Devpriyag , Tungnath , Rudranath , Joshimath , Hemkund Sahib , Adi badri and many more ancient holy places are found in every direction of Uttarakhand and that’s why it is called land of gods ‘Dev Bhoomi’. Nanda Devi, Trishul , Chaukhamba , Kamet, Panchchuli , Swargarohini , Shivling, Meru Parbar , Bandarpunch , Neelkant and many more snow capped mountain peaks are present in the uttarakhand region of Himalaya adding to the beauty of this area and surroundings. The lower mountains makes ideal destinations for tourist interested in adventure activities like trekking, high altitude camping, rock climbing etc apart from being ideal destinations for photographers and nature lovers to satisfy their passion. 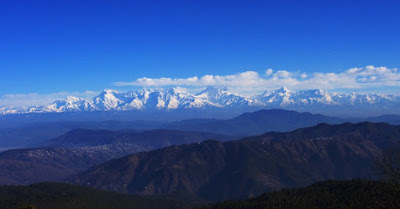 The part of Himalaya in Uttarakhand consist of major glacial formations that include Banderpunch , Doonagiri , Khatlang , Gangotri , Nanda Devi in Garhwal region and Kaphni , Milam , Pindari and Ralam Glaciers in Kumaon Region. Lot of tourists takes trekking expeditions to these glaciers passing through beautiful surroundings and majestic views. 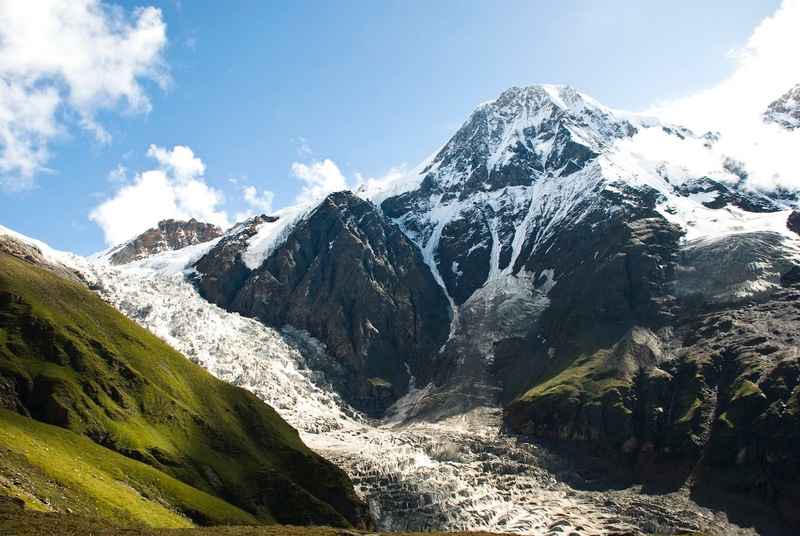 These glaciers are the birth places of many rivers and streams which on their journey towards planes converge into big rivers that have water flowing throughout the year providing water supply in the northern part of India. The high-altitude grasslands, locally called 'Bugyals' gives a uniqueness to the natural beauty of Uttarakhand. These grasslands are generally found above 2700m in Himalayan Mountains and are pasture lands for wild as well as domestic animals. These grasslands are generally soft slopes with wide spread emerging in between forests and providing awesome opportunity for picnic and camping activity apart from giving you astounding views of the snow-capped mountain peaks and cool cool breeze flowing on your face. The experience can leave you amazed. Some of the best known Bugyals of the state are Bedni Bugyal near Karnpriyag. Auli and Gorsou Bugyal near Joshimath , Kush-Kalyani bugyal and Panwali bugyal near Tehri , Dayara Bugyal in uttarkashi. The holiest of all Hindu rivers, the Ganga, gushes from Gaumukh in the Gangotri Glacier of Uttarakahnd and is worshiped at all places it flows till it meets the sea at the Bay of Bengal. A dip in the holy waters of the Ganga promises to wipe the soul’s slate clean of all sin. 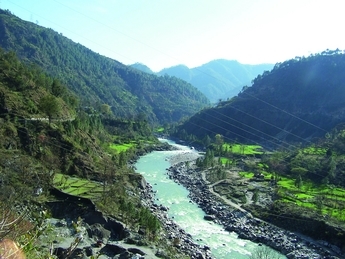 Other famous rivers in the region are Yamuna, Bhagirathi, Alaknanda , Mandakini, Dhauli Ganga, Kali Ganga, Girthi Ganga, Rishi Ganga, Bal Ganga, Kosi. The banks of these ever-flowing rivers are dotted with shrines and temples and are often full of pilgrims at different times of the year, celebrating big and small festivals, anniversaries and special occasions. Uttarakhand rivers are not only for holy dip but you can also enjoy adventure activities like rafting , boating , fishing , waterfalls , Trekking and camping on river side’s. Huge hydropower projects on these rivers like Tehri Dam and many upcoming projects are bound to become source of green energy in the coming years. Uttarakhand being the land of Gods and home to places of religious significance and importance is automatically rich in culture and heritage. Fairs also called Melas are celebrated with passion and dedication. They are an integral part of the social and cultural life of Uttarakhand. If you want to feel and see the cultural diversity of this state one should visit these fairs and festivals. People from all communities participate in these Melas and one can witness the unity in cultural diversity among the masses. 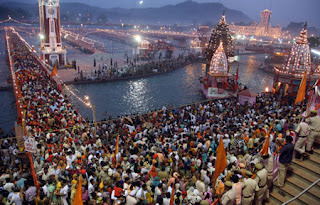 Kumbh Mela which is one of the biggest and most sacred religious functions in the world is celebrated at Haridwar after every 12 years. Hundreds of millions of people converge on the bank of river Ganga during this festival to take a dip in its holy water. 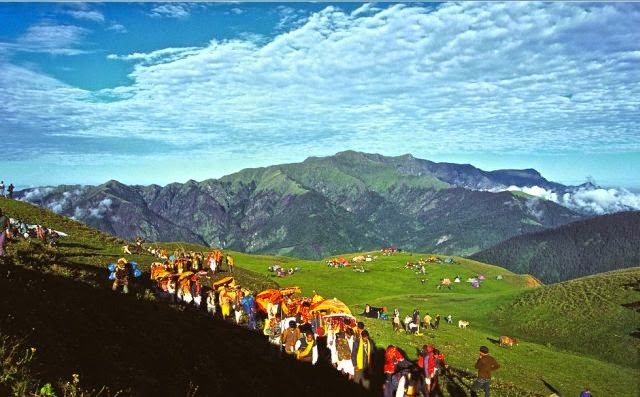 Kanvad Yatra is an annual pilgrimage taken up by lakhs of followers of Lord Shiva in the month of Shravan to fetch holy waters of River Ganga from several places including Haridwar, Gaumukh and Gangotri in Uttarakahnd. Nanda Devi Raj Jat festival offers an unparalleled and complete experience to the travelers with interest in local cultural and religious traditions of Uttarakhand as well as to those who are decent trekking enthusiasts. Its sanctity for locals is equal to Kumbh and it is one of the most lively and colourful festivals in the region. Magh Mela , Bissu Mela , Uttarayani Mela and others are also celebrated in Uttarakhand and a tourist interested in knowing the local culture and tradition can visit these festivals and be part of them. 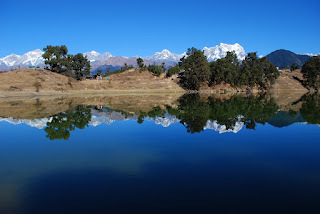 There are numerous lakes scattered across the geography of uttarakhand. The most famous of them is the Nainital Lake. Nainital is also called the lake district of Uttarakhand because of presence of many lakes in the surrounding which include Bhimtal , Saattal , Naukuchiyatal. Thousands of tourist enjoy there vacations at these places enjoying boating , kayaking and other water sports apart from enjoying the beauty of the surroundings. On the Garhwal Side the Lakes are mostly smaller and high altitude lakes like Roopkund ,Hemkund, kedartal , Dodital , satopanth Tal , Deoria Tal. These are mainly visited by adventure seekers as reaching these lakes will require you to do trekking through tough treks. 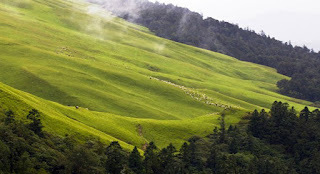 Uttarakahnd is home to some of the best hill stations of India. The majestic snow capped Himalayan peaks, rivers, beautiful valleys and lakes make the places in uttarakhand a ideal destinations for relaxing and rejuvenating yourself during your vacations and indulge into numerous activities around. Some of the famous hill stations of uttarakhand are Nainital, Mussoorie , Ranikhet , Kausani , Pauri , Tehri , Almora and many more. These hill stations offer you opportunity for boating , trekking , photography , skiing , nature walk and much more apart from offering you to spend your time among the beautiful , clean and calm surroundings. Uttarakhand is possibly one of the few regions in the world where all the life zones from sub-tropical hot to Arctic cold exist within a distance of 100 Km, thus providing an astoundingly rich floral and faunal diversity. The State has 12 National Parks and Wildlife Sanctuaries that cover 13.8% of the total area of the state. The various parks and sanctuaries are located at different altitudes varying from 800 meters to the high altitude protected areas at 5400 meters. Nanda Devi Biosphere reserve, Valley of Flowers National Park, Corbett NationalPark, Rajaji National Park, Binsar Wildlife Sanctuary are major tourist attractions. Numerous varieties of Flora and Fauna are found in these places and are a delight to Nature lovers, wildlife enthusiasts, bird watchers, Researchers and Photographers. Visit our website for more holiday options in India. @2014 Aao Chale. Simple theme. Powered by Blogger.